The unofficial start of summer may have been over Memorial Day weekend, but according to Mother Nature’s calendar, summer officially starts this month. In the spirit of lazy summer days, I have three recipes for you this month that are a combination of easy and cool. Serve them if you have people over, but make sure they’re people you like–because I guarantee they’ll be back after they taste these offerings. 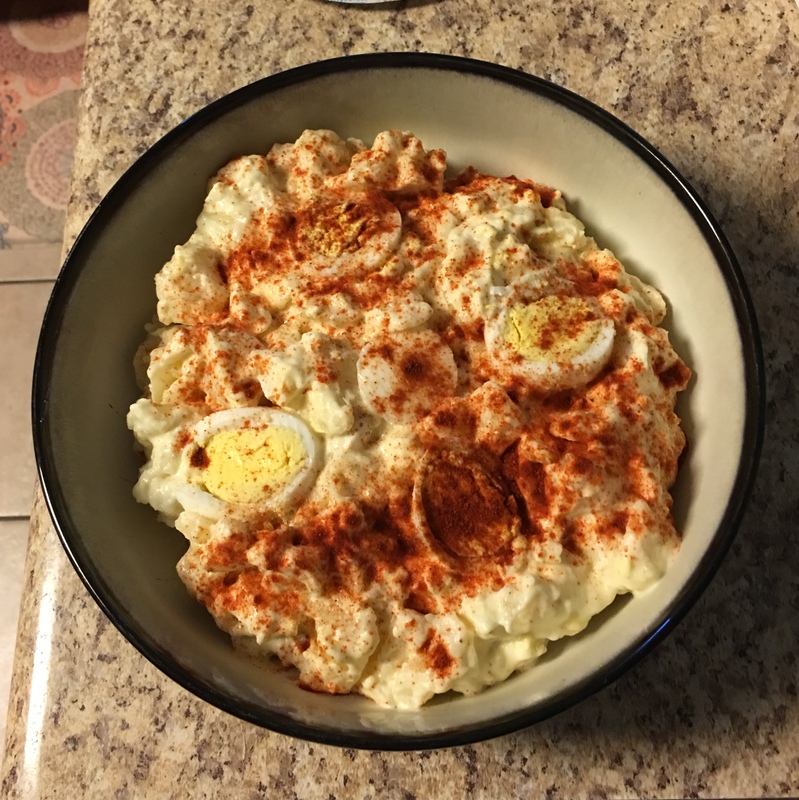 I tried this recipe just a couple days after Sharon sent it to me and it’s my new favorite potato salad. I have one child who hates potato salad and she asked for seconds. It’s that good. A quick note: I only had half an onion, so I used that instead of a whole onion. I also grated it instead of chopping it. 1 In a large pot, cook potatoes in boiling water until tender. Drain and cool. (I like to refrigerate for at least an hour to keep potatoes firm.) Peel potatoes; cut into bite size pieces. Chop eggs, saving one for the top, and add to the potatoes. Add chopped onion. 2 Dressing: combine mayonnaise, milk, vinegar, mustard, sugar, salt and pepper. Pour over potatoes; toss well. Adjust seasonings if necessary. Spoon into a serving bowl. Garnish with egg slices and paprika. Chill until serving. Yield: approximately 8 servings. Orange Slush: for adults only! In a medium saucepan, boil 7 c. water. Add sugar and stir until dissolved. Heat remaining 2 c. water and add the 2 teabags. Set aside while tea steeps, then discard teabags. In a 13×9″ baking dish, mix the orange juice concentrate, lemonade concentrate, and vodka. Add sugar water and tea, stir to combine well, and place in freezer. Allow mixture to become slushy, stirring occasionally. To serve, fill glass 2/3 full with slush, then top with ginger ale or lemon-lime soda. Preheat oven to 350 degrees. In a medium bowl, combine topping ingredients until crumbly. Press into 13×9″ dish. Bake for 15 minutes, then allow to cool completely. In a medium bowl using an electric mixer, mix ingredients for Filling #1 until fluffy. Spread on cooled crust. In another medium bowl using an electric mixer or whisk, mix ingredients for Filling #2. Spread over first filling layer. Cover entire dessert with the remaining Cool Whip and chill until ready to serve. I hope you enjoy this month’s selection of recipes. I’m always looking for new stuff, so if you have anything to share, please let me know! I’d love to feature your recipes in upcoming posts.